When a member of the family suffers from food or seasonal allergies, managing symptoms and reducing the likelihood of contact with known allergens is of the utmost importance. Fortunately, modern technology offers a slew of options for doing just that, with iPhone apps available in the famed App Store to do everything from tracking pollen counts to discovering potentially problematic food ingredients to reminding sufferers to take their medication daily, just to name a few. 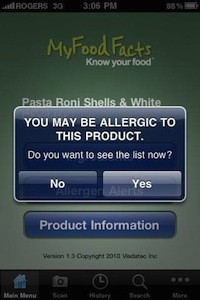 If you or someone in your care suffers from allergies, these 10 iPhone apps may prove to be helpful. MyFoodFacts – Grocery shopping can be a mighty undertaking when someone in the household suffers from food allergies, however this app can make the task a bit less arduous. Tech-savvy shoppers can simply snap a picture of a product’s bar code with their iPhone’s camera and MyFoodFacts will return a detailed list of potentially allergenic ingredients. Sesame seeds, tree nuts, peanuts, egg, shellfish, soy, fish, wheat, and milk are among the app’s focus, helping shoppers avoid foods that could spur potentially serious reactions. Allergy Advisor – Something of a one-stop-shop app for those suffering from respiratory allergies, Allergy Advisor offers pollen counts and weather forecasts for a user’s area, the ability to log symptoms and triggers, special storage for medical professionals’ contact information, and treatment/prescription refill alerts. The free app is, however, supported by ASTEPRO® nasal spray. Allergy Track – The ability to track your respiratory allergies in order to accurately report symptoms and triggers to your doctor is at your fingertips with PLB Melody’s free Allergy Track app. Logging the intensity of symptoms and monitoring allergic episodes over a significant period also makes it easier for your allergy specialist to determine the impact that your allergies have on your daily life and build an accurate allergy profile for more effective treatment. ZocDoc – When allergic reactions require non-emergency medical attention, especially when you or an allergic family member is away from home, ZocDoc can help you locate a doctor and book an appointment easily. Entering your zip code and insurance information will return a list of doctors that are in your network and their available appointment times, and with the tap of a finger your appointment is booked! RxMindMe Prescription – Allergies that require medication can often go untreated during hectic times simply because taking medication slips your mind. RxMindMe allows you to create profiles for several members of the family, sends notifications to remind you to take your medication or administer it to a child, and track the remaining quantity of medication you have on-hand. Allergy Alert – Free from Pollen.com comes Allergy Alert, an app designed to update users with pollen and allergy forecasts. Environmental forecasts like an asthma index also help those with allergies or children who suffer from allergies to stay informed about environmental factors that could exacerbate the condition and increase the severity of symptoms. iEatOut Gluten Free & Allergy Free – Ordering safe entrees from a restaurant is no easy task for those that suffer from food allergies; fortunately, iEatOut allows users to select items from a variety of ethnic cuisines that do not contain known allergens or gluten. The app also helps users communicate their needs to wait staff regarding food preparation and ingredients. Recalls Plus – Product recalls are no laughing matter; they can, however, be hard to keep up with. Using Recalls Plus takes much of the legwork out of discovering product recalls, especially those that are related to known allergens. While the app is very useful for parents of children who suffer from allergies, it also provides valuable safety recall information as well. Air Quality Pro – Before planning an outing or trip to the park, allergy and asthma sufferers should determine whether or not their area is under an air quality alert. Air Quality Pro monitors the air quality index in major cities around the United States and returns forecasts that include detailed information and maps. Cook it Allergy Free – Cooking delicious, allergen-free meals at home is easier than ever with the Cook IT Allergy Free app, which makes simple work of substituting allergenic ingredients with safe alternatives. Modifying favorite recipes to make them safe for those suffering from food allergies isn’t always easy, but this app does most of the work for you. Users can also share their allergen-free custom recipes through a variety of social networking platforms. Using these apps can make a major difference in the way that you approach and handle allergy management, but it’s important to remember that these tools, like any others, are not infallible. There’s no substitute for the advice of a medical professional or your own personal experiences, so if an app suggests that a particular item is safe and you’re not completely convinced, you should always follow your instincts and knowledge base.